5 cups thinly sliced onions, 3 sliced garlic cloves, 1 tbsp unsalted butter, 2 tbsps extra-virgin olive oil, 4 cups chicken or vegetable stock, 1/2 tsp salt, 1/4 tsp freshly ground pepper, 10 slices bread (sliced about 1/4 inch thick), olive oil for brushing, grated cheese. Heat the butter and oil in a large saucepan, and add the sliced onions and garlic to it. Reduce the flame to medium-low heat, and cook for about one hour, stirring from time to time until the onions are limp and nicely browned. Add the stock, salt, and pepper and bring to a boil. Reduce the flame to low, cover the pan, and let it simmer for 30 minutes. Meanwhile, brush each bread slice with olive oil. Preheat the oven to 400 degrees, and bake them on a baking sheet for about six to eight minutes until both sides are brown. 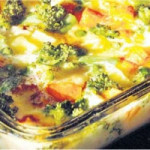 Remove, sprinkle each slice with cheese, and put back into the oven until the cheese melts. Serve hot, and top each bowl of soup with two of the bread croutons you’ve just made.